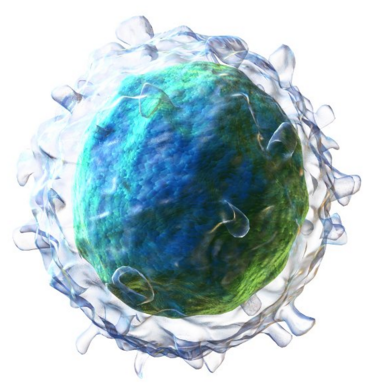 Researchers have identified a subset of B cells that contribute to multiple sclerosis (MS) pathology independently of antibody production. The findings explain why B-cell depletion therapy can limit new disease activity in MS patients, which “was a surprise to many, given the traditional view that MS is a T cell–mediated disease”, say Amit Bar-Or (McGill University, Montreal, Quebec, Canada) and co-researchers. After B-cell depletion, patients with relapsing–remitting MS retain their abnormal antibody profile, yet they have a significant reduction in relapses. The team’s research, published in Science Translational Medicine, shows that this is due to the removal of a subset of B cells that express granulocyte-macrophage colony-stimulating factor (GM-CSF), along with high levels of tumour necrosis factor (TNF)α and interleukin (IL)-6, with a corresponding reduction in levels of the anti-inflammatory IL-10. These B cells were present in healthy controls, accounting for 4.4% of their B cells, but were significantly more frequent in untreated MS patients, at 9.3%. And these cells were more inducible in MS patients, with activation resulting in a more highly significant difference between the frequencies of these cells in patients and controls. The B cells were capable of inducing the release of proinflammatory molecules from macrophages, and this effect was GM-CSF dependent; blocking GM-CSF completely blocked the effect. Moreover, the proinflammatory effect was larger for B cells taken from MS patients than those taken from controls, regardless of whether the target macrophages were taken from patients or controls. After undergoing B-cell depletion, patients’ macrophages had a less inflammatory profile, with less expression of IL-12 and IL-6 relative to before depletion, coupled with higher expression of IL-10. And even when patients’ B cells had returned to pretreatment levels, the frequency of those expressing GM-CSF was less than before treatment, and the level of GM-CSF secretion was lower. Also, macrophage production of IL-12 and IL-6 remained reduced relative to pretreatment levels, while IL-10 expression was higher.